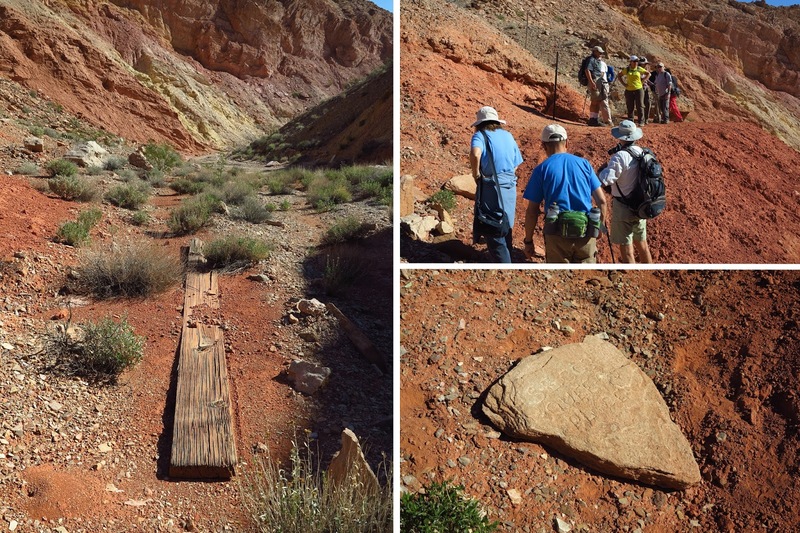 Thinking outside the box, fifteen hikers arrived at the upper Bootleg Canyon trailhead, a new trailhead for the club. 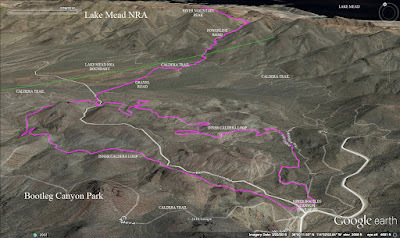 To get there, go to the base of the zip line parking and continue up the well-maintained dirt road from there until you arrive at the large saddle trail junction area half way up to the top of Red Mountain. There is a large dirt parking area just below the road accessed by a dirt road ramp down on the left side. There are several trails that can be taken from this point. 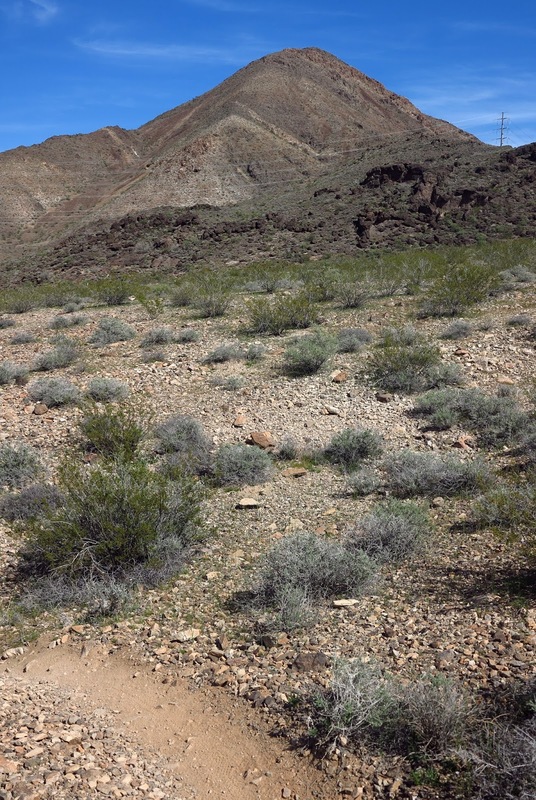 River Mountain is the highest peak in the River Mountains and sits beside a canyon strung with powerlines. 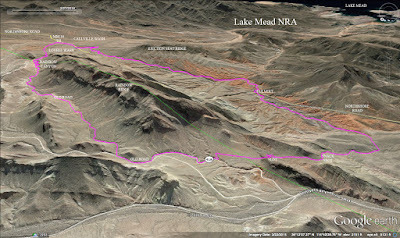 Our traditional route to the peak involves an 8 mile endeavor starting from the River Mountains Trail parking lot next to St. Jude's Ranch. 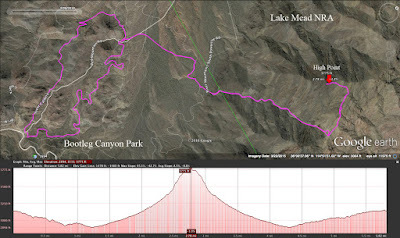 Today, the route would be only 6 miles, perhaps the shortest route possible to River Mountain Peak without bushwhacking straight across the open desert. 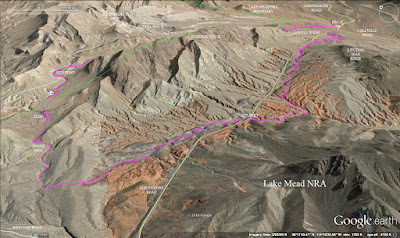 We connected with the Inner Caldera by taking a small trail on the west side of the parking lot. We would be traveling the loop in a clockwise direction. The loop started out with beautiful views toward Las Vegas. But, it quickly demanded our attention when we met a series of very steep hills going down and back up. We call these types of hills "bicycle hills." The two wheelers seem to love this sort of challenge. For us, well, we learn to tolerate them! One bicyclist passed us all morning. The trail did a couple of switchbacks down and junctioned with the Caldera Trail. We decided to continue around the Inner Caldera even though we would be hiking on the Caldera later. When the Inner Caldera junctioned with the Red Mountain Road (dirt), we left the trail and started our ascent on a series of old gravel roads. 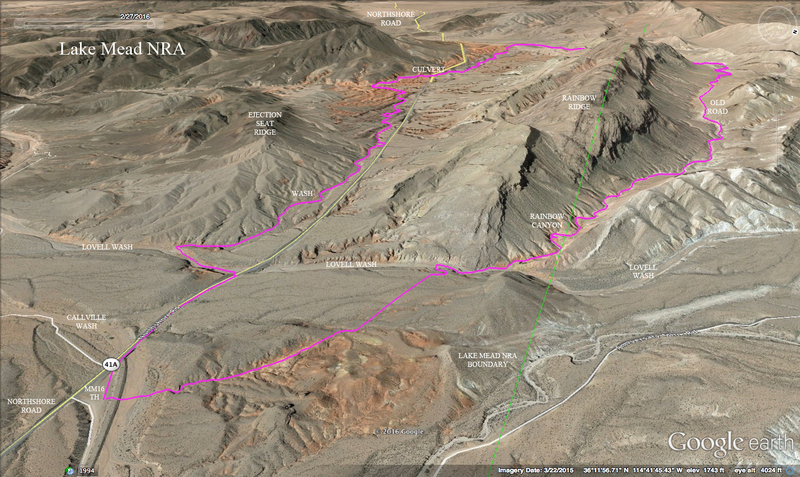 At one point, we followed the Caldera Trail for a short distance. Finally, we arrived at the bottom of the Powerline Road Canyon. It was interesting to see that the power company had reinforced the road with a thick new layer of gravel. 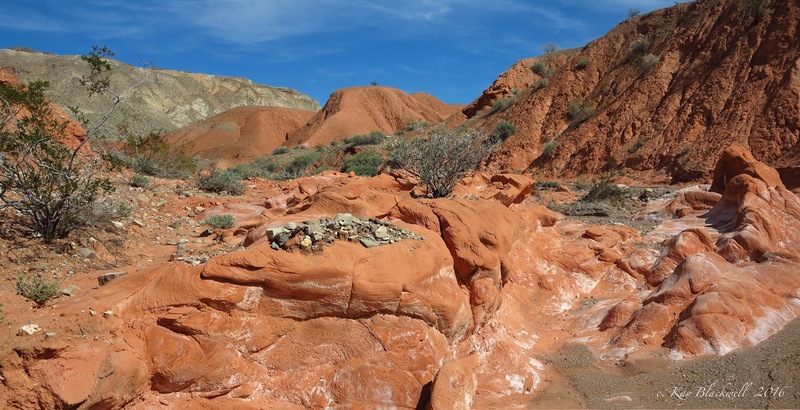 The bedrock that we used to hike is no longer visible. Better for the power trucks, not better for us! Anyway, we climbed up the road at our own speed but did not get too far apart. 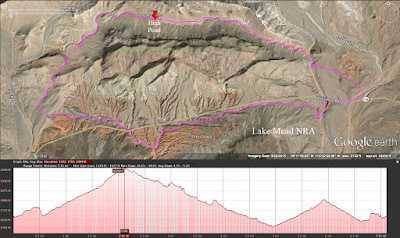 At the Power Pole Saddle, we gathered again and discussed the peak trail approach. It was quickly decided to ask Chris to do the honors and lead the group up. 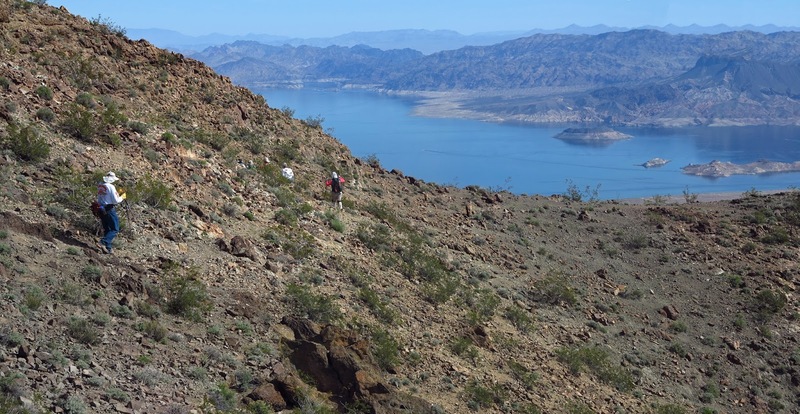 The beautiful view of Lake Mead at our right shoulder continued all the way up to the upper saddle but we were too busy climbing to stop and notice. 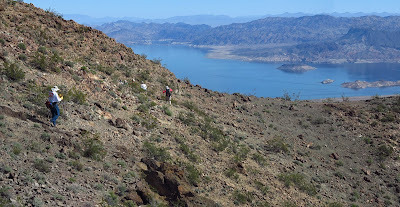 The trail is filled with loose rocks and the slope is very steep. After two or three breathers, we reached the upper saddle and waited for the remaining hikers to arrive. 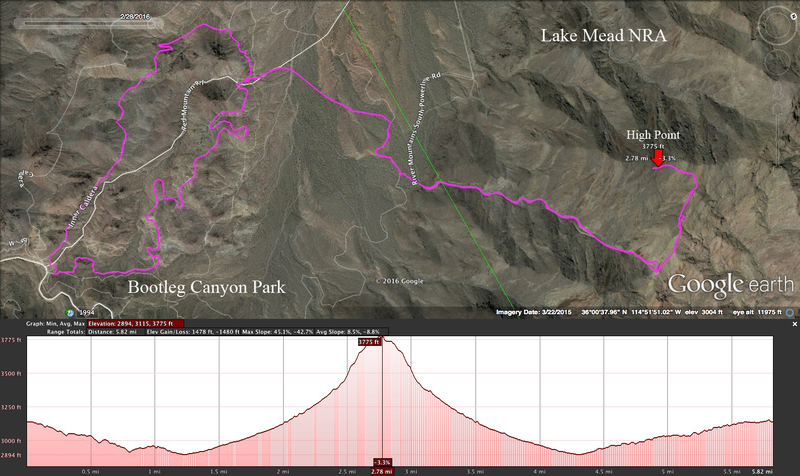 From there, the trail takes a left turn onto a contour of the intermediate peak above. In other words, the writer enjoyed being on River Mountain Peak today. Stronger hikers might would have preferred a longer approach. 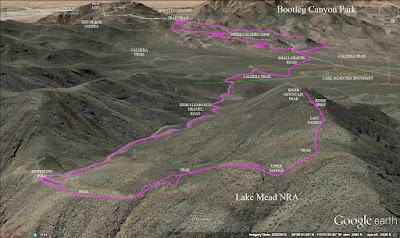 There was a 360 degree view from the peak that included Lava Butte, Las Vegas & the Spring Mountains, Red Mountain & Bootleg Canyon, Lake Mead Boulder Basin, and the Black Mountain (Henderson) escarpment. Too soon, it was time to descend. Carefully, we each took to the rocks. 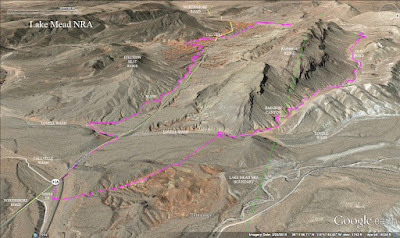 A bit of scrambling, the contour trail and the loose descent between the upper saddle and the Power Pole Saddle. 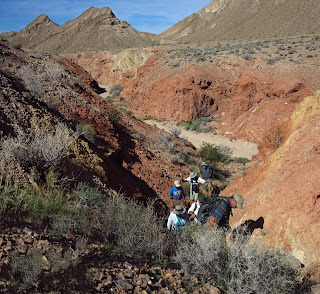 After gathering there, we descended the gravel road through the canyon. The gravel was much easier to descend than ascend. From the bottom, we retraced our steps back to the Inner Caldera Loop Trail. (i.e. gravel road, Caldera Trail and old gravel road) At the road / trail junction of the Inner Caldera, we turned to the left and found the trail routing around the corner of the hill. 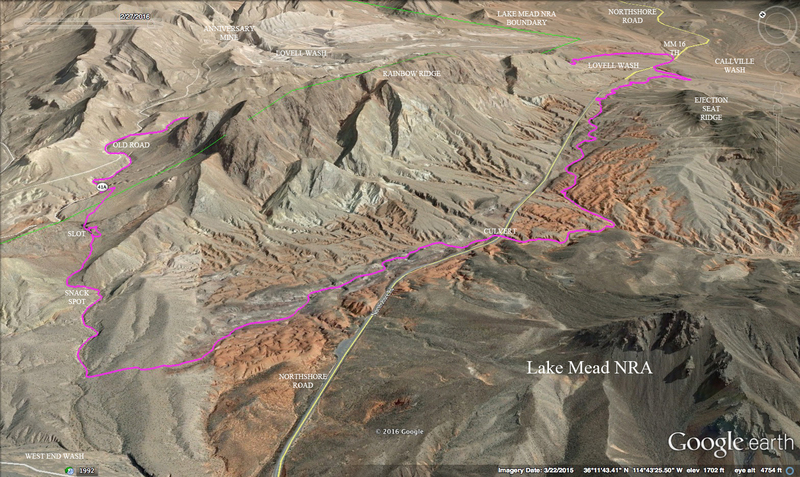 This second half of the Inner Caldera winds around a lot giving us great views in every direction. There was a slow ascent all the way back to the cars. Sometimes we could see our trail across a gully and sometimes we could see the Caldera Trail paralleling us on a higher contour. Near the end, we bypassed another one of those steep bicycle hills and crossed a dirt road to continue on the trail. A few more twists and turns then the trail led us right into the parking lot where our cars were parked. Something new and different. A very pleasant outing to a beautiful peak. 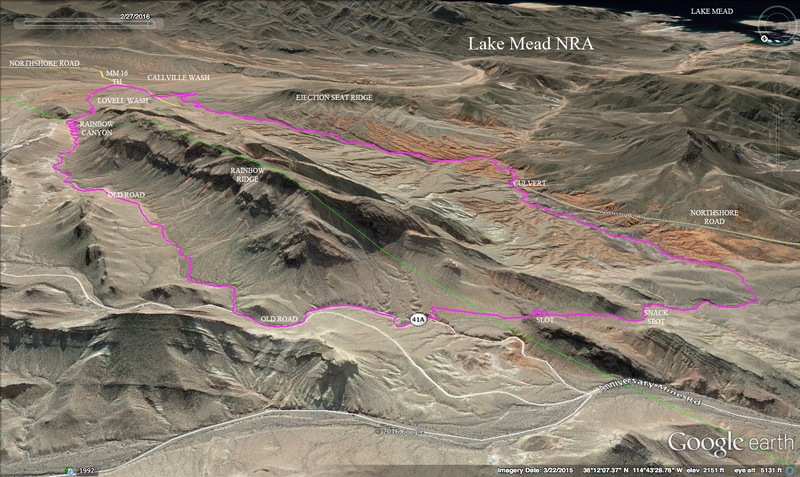 Rainbow Canyon is a great area to explore from mile marker 16 on Northshore Road in the Lake Mead NRA. Fourteen hikers parked at the large dirt trailhead and crossed up and over the embankment in front of our cars. 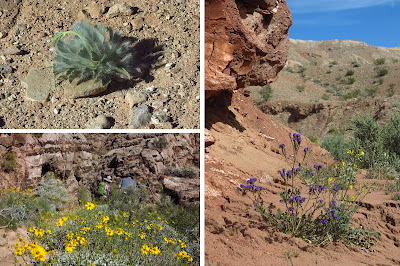 This put us in Callville Wash for a moment until we climbed out the other side and hiked overland below the interesting balanced rocks to our right. Another steep drop into Lovell Wash put us just a little way down from Rainbow Canyon's entrance. 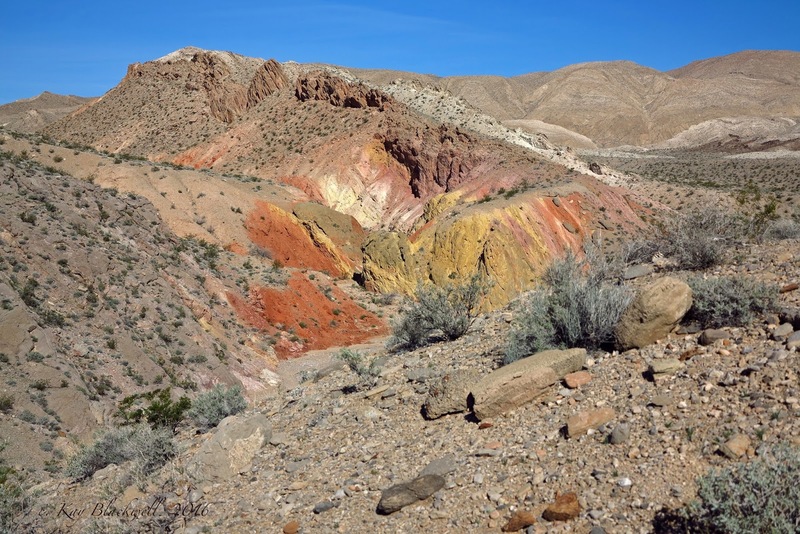 The mustard yellow, red and orange colors that decorated the entrance to a small side canyon marked the spot. The striking colors lasted for around a mile. In the canyon, we saw a few bear paw poppies that were starting to bud. An old mine is marked with posts up on the right side of the canyon. 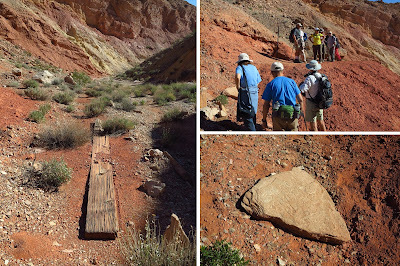 There is an old piece of lumber, a rock with markings on it and the mine itself. The hole is reported to be very deep so a few hikers peered down into the abyss just to be sure. It is storied that a hiker once lost their hiking stick in said abyss! 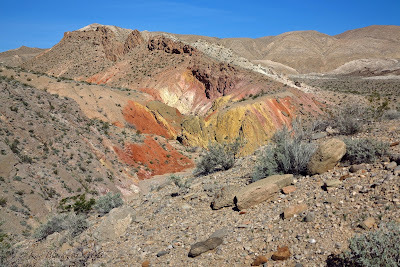 After the mine and a beautiful wall, we continued out the wash and the colors started to fade away. To our right, we passed another canyon. Then our route started up the ramp of an old unused dirt road. The road likely served the mine that we had just visited back in the day. As we neared the top of the hill on the road, we got a glimpse of Griffith Peak in the Spring Mountains. The road junctioned with another dirt road that had vehicle tracks on it. We turned to the left then soon dropped down to the left onto another road that only a very high clearance vehicle could possibly negotiate. And, there were some vehicle tracks! We also followed the tracks of a domesticated horse all morning. 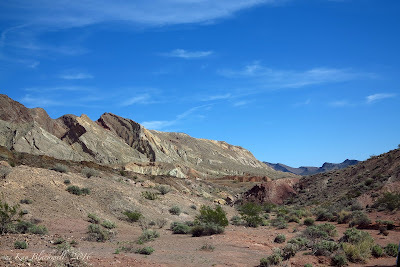 This canyon was very interesting and had a lot of the same colors as Rainbow Canyon. The bedrock was smooth and gnarly. The walls were colorful and around 20 feet high. 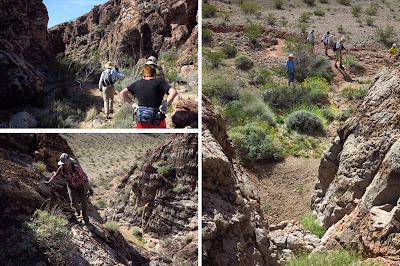 We turned a corner around to the left and found a good side wash to use to climb out as seen in the photo to the left. 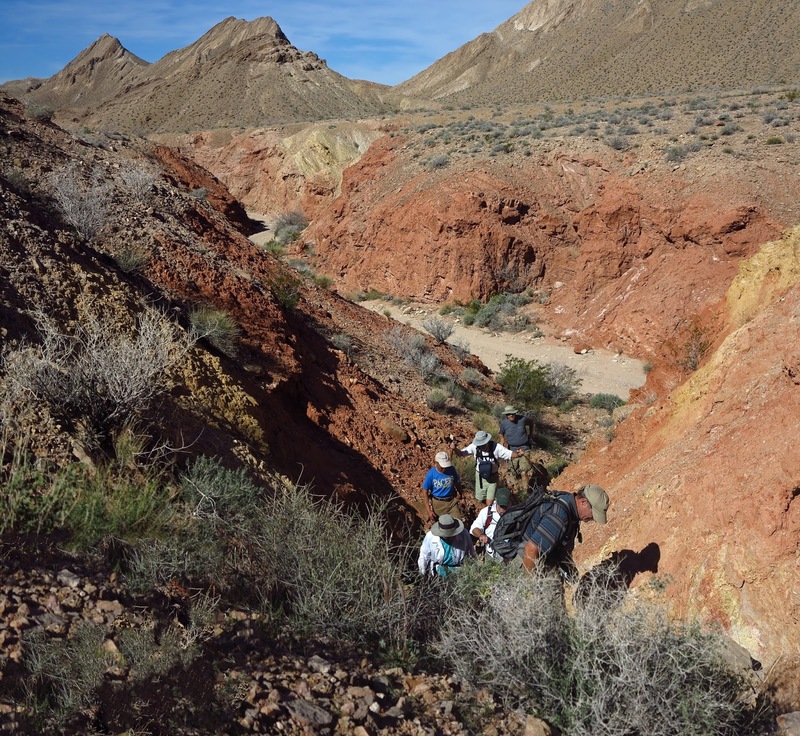 On top of the surrounding Horse Spring Formation land, we crossed over to another wash in the area. 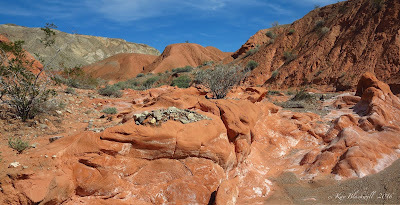 This wash had an interesting slot made with chert covered limestone / dolomite rock. Seven hikers of the group decided to check it out. We dropped down through the slot all the way to the final expected dry fall. Another fun scramble put us up and over the wall on the left. Soon, we were joining the rest of the group at the bottom of the dry fall. Down the wash a little more and we were in a good place for a snack break. It was a pretty warm day and we needed just a tad of shade for our rest. 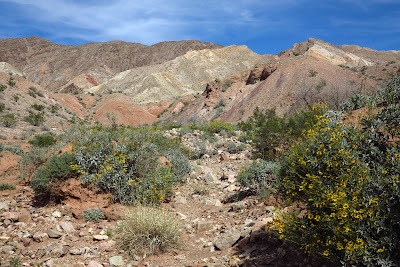 Next, we continued down the widening wash then climbed out up to our left to circle around the west end of Rainbow Ridge, the mountain ridge that had been at our left shoulder since the start of Rainbow Canyon. This connected us with another interesting wash that we followed down to a culvert that allowed passage under Northshore Road. We arrived in a bright red/orange area of sandstone. The views were gorgeous all around. 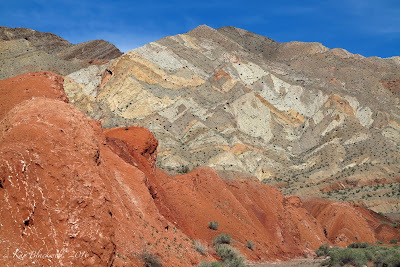 We turned left into a redstone wash and followed the washes staying parallel to the highway which laid out of our sight to our left. 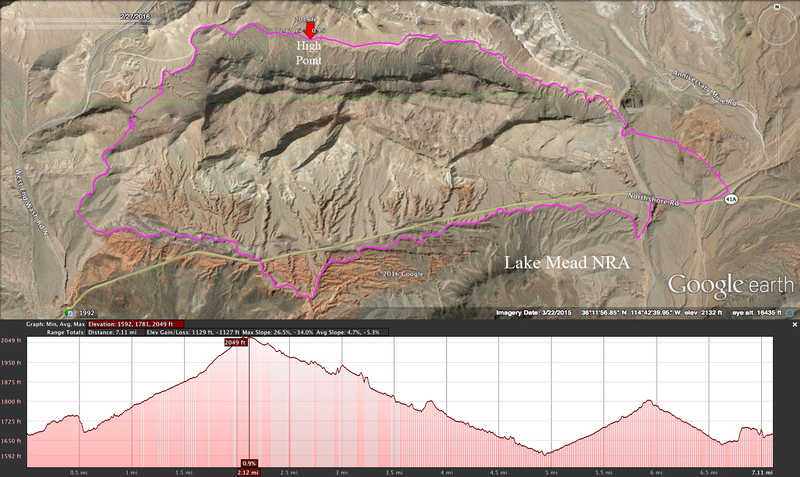 At around mile marker 15, we had to finagle our way over a high point but the wash on the other side continued. 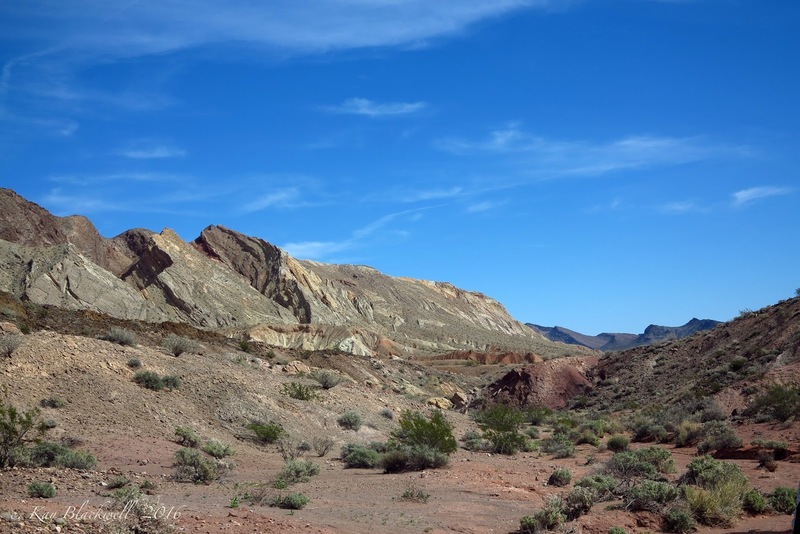 Finally, we arrived at Lovell Wash, a very wide wash. Here, we turned to our left, hiked up the wash to the road tunnel, then climbed up to the road and finished the hike by walking down the side of the road. It was a lovely day full of color. This was the debut of this particular route and it is a good one.